Mophie, known for its Juice Pack smartphone cases that are embedded with batteries, has been acquired by accessory manufacturer Zagg. The price of the transaction is a tentative $100 million. The purchase price can be higher depending on how Mophie performs between April 1, 2016 and March 31, 2017. The combination of Zagg and Mophie will produce the market share leader in battery cases, external batteries, screen protection and keyboards for tablets. Together, both companies reported 2015 revenue of $470 million. The purchase is being funded by a combination of cash and debt, and will close during the first quarter of 2016. Mophie launched its first Juice Pack for the Apple iPhone 3G/3GS in 2008. Back then, the case featured an 1800mAh battery. 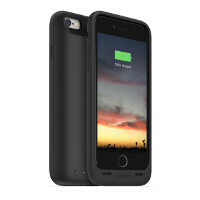 The Mophie Juice Pack for the Apple iPhone 6s features a 2750mAh battery and is offered in nine color options. That's a lot of dollars for a case maker. If OEM will focus on the battery life of every device. This company will not worth this amount. Even worthless, worst case scenario. I believe in 2-3 years time when the battery technology advances further (keeping in mind Huawei's effort and other OEM'S) this company will be out of the market. People will always want more. Just to say I can go 4 days with out charging my phone.